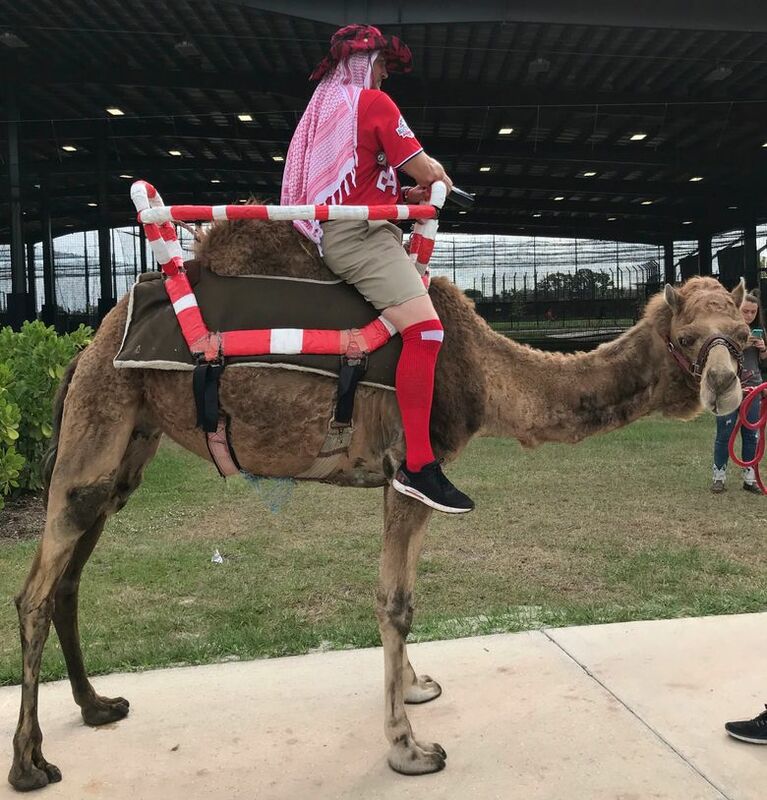 The Washington Nationals, who finished February 1-4-1 in Grapefruit League play, reeled off a four-game winning streak to open March after manager Dave Martinez had three camels pay a visit to training camp. Well, that’s one way to get your team over the hump. Texas Wesleyan baseball coach Mike Jeffcoat nixed a recruit from Colorado because that state’s “liberal politicians” legalized marijuana use, so the school fired him. Or as eye-for-an-eye advocates prefer to frame it, he weeded himself out. Golfer Justin Thomas just had his wisdom teeth removed. In keeping with the theme, the oral surgeon replaced his divots. Mattel, saying it wants to provide better role models to inspire young girls, is launching 17 new Barbie dolls, including aviator Amelia Earhart, gymnast Gabby Douglas and snowboarder Chole Kim. What, no Tonya Harding action set complete with a lead-pipe Ken? Frances McDormand’s Academy Award was stolen during an Oscars after party. No truth to the rumor that the perp was wearing a Tom Brady jersey. The free-spirited promotions staff for the St. Paul Saints independent-league baseball team is considering a ballpark-wide food fight to commemorate the 40th anniversary of “Animal House,” the St. Paul Pioneer Press reported. So what’s next, fans get free power-tool pedicures on “Dumb and Dumber” Night? Loquacious NFL referee Ed Hochuli has announced his retirement after 28 seasons. So which took longer to finish — Super Bowl LII or Ed’s retirement speech? The Arizona Diamondbacks are bringing back an MLB staple of the 1970s — the bullpen cart. Now for the tough part: Lyft or Uber? J.R. Smith? Now there’s one Chunky Soup commercial we’d pay to see! U.S. Olympic curler Matt Hamilton posted a video explaining his sport using Legos. An MIT student and a software engineer designed a robot that can solve a Rubik’s cube puzzle in just 38-hundredths of a second. So now it’s on to solving much tougher challenges, like Democrats vs. Republicans and the Mariners’ 16-year playoff drought. Norwegian mushers were a surprising 1-2 when this year’s Iditarod Sled Dog Race in Alaska reached the halfway point. Race-watchers say they’d never seen dogs trained to cross-country ski before. Johnny Manziel tweeted he would play football for free. Guess who’ll be the first one called to take a drug test? Nearly every passenger vomited on a turbulent flight from Charlottesville, Va., to Washington, D.C.
That’s what they get for making the Browns’ 2017 highlight video the in-flight movie. From the Sometimes These Items Just Write Themselves file comes word that a group of fired Cleveland Browns coaches — whose former team has gone 1-31 the past two seasons — met up during the NFL combine in Indianapolis at a place called the Rock Bottom Restaurant & Brewery. Pitt basketball coach Kevin Stallings got fired after the Panthers went 0-18 in ACC play this season. Reactions ranged from rival coaches’ best wishes to a pick-me-up bouquet from the 2008 Detroit Lions. What Super Bowl hangover in Philadelphia? In the first 20 days since the Eagles beat the Patriots to win SB LII, pointed out Steve Simmons of the Toronto Sun, the NHL Flyers went 10-1-1 and the NBA 76ers 9-2. The Cincinnati Bearcats women’s basketball team shot 2 for 23, went scoreless in the second quarter and trailed UConn 43-5 at halftime of their American Athletic Conference tournament semifinal. UConn held on to win, 75-21.